Good Neighbor Policy | Delmarva Poultry Industry, Inc.
We advocate for land-use policies and zoning regulations that ensure a thriving chicken industry, while at the same time ensuring family farmers and their neighbors, who may not be familiar with farms, can get along. The poultry industry has been an important component of the Delmarva Peninsula for more than 90 years and remains essential for the economic health and positive quality of life of our region. It has provided a rural way of life for thousands of farm families. It provides jobs for tens of thousands of persons, either directly or through the multiplier effect. In addition, the poultry industry helps keep many farms strong and in business. This in turn leads to continued working farms and much coveted open spaces that non-farm persons can enjoy without charge. While the poultry industry works to feed America, it faces challenges from neighbors. Urban encroachment from persons not familiar with good operating practices on poultry farms and new technologies in poultry houses have led to some misunderstandings and challenges. Poultry growers want to be good neighbors and are committed to working hard to achieve that goal. At the same time, they ask neighbors to be cooperative as well. This document puts forth industry agreed upon Best Management Practices for Good Neighbor Relations. These practices are voluntary. They are offered in lieu of government intervention to improve relationships among poultry growers and their neighbors. Vegetative buffers need to be part of the design and layout of new houses, not an afterthought for incorporation after houses are built. Vegetative buffers around poultry houses or poultry farms can provide good neighbor, environmental, and bird production benefits. Specifically selected trees, tall grasses, and shrubs, planted in appropriate locations, can eliminate or reduce neighbor complaints about poultry operations. Each farm's needs are different and care must be taken to select trees and sites that are farm specific. Work must be done to maintain the buffers once they are established. Trees around poultry houses can provide visual screening from neighboring properties, can capture the normal dust, feathers, and odors associated with poultry production, and through their roots can absorb soil and water-held nutrients such as nitrogen and phosphorus. Additionally, trees can add value to the poultry property. Poultry growers are urged to establish vegetative buffers around new and existing poultry farms and houses. Growers who have been working with government agencies, such as the conservation districts, the USDA Natural Resources Conservation Service, and/or the university Extension Service on the construction of new houses, will examine the proposed site with consideration given to the guidelines in this document, including but not limited to density of poultry houses on the property; the configuration of houses, manure storage buildings, and carcass-handling systems as they relate to neighbors; the placement of ventilation fans to minimize disturbances to neighbors; the need for and/or early design of Vegetative Environmental Buffers; the potential spread of diseases; and outreach to adjacent property owners early in the process to minimize neighbor concerns. While existing poultry houses will not be moved to accommodate neighbors, poultry growers need to be mindful of certain circumstances that could minimize inconveniences to neighbors. Attention should be paid to possible locations of future residential housing in relation to the farm. Although it is not possible to plan for every contingency, we can use good judgment about forecasting future development. All new poultry houses and manure storage buildings must adhere to standards that meet county zoning regulations. These standards include proximity to adjoining property, adjoining dwellings, adjoining public use facilities, public roads, and even neighboring poultry houses. The exceptions would be those requested by growers with existing poultry houses and approved by the county zoning authorities. They must adhere to zoning ordinances in effect at the time that permitting was approved. To create consistency among Delmarva's counties, the following standards are endorsed by Delmarva's poultry industry. These minimum standards in some counties may be less than what now is in effect. In those situations, we do not propose to loosen the existing standards. The voluntary guidelines shown below will apply to new poultry houses on a farm, but not for new houses replacing old, out of production houses or now-destroyed houses. For replacement houses on existing farms, county land use and zoning authorities are urged to keep in mind the economic investments growers have and to grandfather poultry production on that site to allow them to continue their agricultural businesses in agricultural areas even if the new houses do not meet the voluntary standards shown below. Existing setbacks for existing poultry houses will be extended to new poultry houses on existing poultry farms to allow consistency on the property and to avoid economic hardship for growers wishing to expand their operations. For new poultry houses and accessory structures, it is our goal to have a minimum 400 foot setback with a buffer from a legal residential dwelling not on the poultry farm. There can be a site specific reduction of the 400 foot setback with installation of additional buffers to create a setback of no less than 300 feet. New poultry houses and accessory structures should be a minimum of 200 feet from the center of the public road with installation of a minimum 25 foot-wide Vegetative Environmental Buffer. New poultry houses and accessory buildings should have a minimum setback of 100 feet from property lines with a recommended 50 foot-wide buffer or a 25 foot-wide buffer with increased plant density. As part of the construction of poultry houses, growers should plan and install vegetative buffers of specifically selected trees and tall grasses to capture air emissions from the houses and to use nutrients already in the soil near the houses. Poultry companies and lenders are urged to consider the need for and/or early design of Vegetative Environmental Buffers as a prerequisite for placing birds in the houses. New poultry houses should be sited to allow adequate vehicle access without jeopardizing safety on public roads while minimizing noise-related concerns for adjoining properties. Farm entrances should be strategically placed as far from neighboring dwellings as practical while still allowing adequate vehicle access to the poultry farms. In other words, driveways should not be placed next to neighbors if workable alternatives exist. Particular attention should be given to the configuration of poultry houses and manure structures/composters on poultry farms. Tunnel fans, necessary for maintaining good air quality and optimum bird welfare conditions, need to be located on the ends of the houses where there is minimal inconvenience to neighbors. When making these decisions, growers and poultry companies should consider the direction of prevailing winds and the proximity to neighbors' homes and properties to prevent, as far as practical, noise pollution, visual disturbances, and the movement of odors, dust, and feathers to adjoining properties. While such things are normal for poultry farms and should not be considered nuisances in agriculturally zoned areas, they could be objectionable to persons not familiar with chicken production. While state and county right to farm laws should exonerate poultry growers from such complaints, growers need to make every effort, when practical, to minimize such practices that some people could consider offensive. Even when poultry houses and manure structures/composters are properly located to avoid neighbor disturbances, Vegetative Environmental Buffers should be encouraged. In addition, growers will work to operate manure storage structures and carcass composters to minimize objections to persons on adjoining properties, dwellings, and public roads. As with poultry houses, they should be placed according to county ordinances. Such environmental practices should be sited so the interior of these structures is not visible to travelers and neighbors. Poultry farms on the Delmarva Peninsula are required by law to have nutrient management plans. Many farms are required to meet additional environmental standards if they are classified as Concentrated Animal Feeding Operations (CAFOs). These requirements guide growers on how to handle their manure, whether they apply it to land or move if off their farms. Poultry growers must be in compliance with the laws and regulations and are expected to have and implement their nutrient management plans. When possible and practical, poultry growers should work to minimize the spread of dust, feathers, and odors by scheduling land application of manure at times that will least affect neighbors. This is not always possible due to weather conditions and the scheduling of poultry house out cleanouts that often are outside of their control. Manure must be handled and stored properly following state and federal requirements. Considerable improvements have been made in carcass disposal in the last decade. On-the-farm composting of carcasses and government approved cremators are acceptable practices and ones that produce a safe product that can be recycled into crop growing operations. Other options such as on-farm freezers allow proper carcass handling. Poultry growers have a responsibility to ensure timely disposal of carcasses in an approved manner. This provides a better environment for growing chickens, prevents odors, and prevents access to carcasses by wild birds and vermin. Despite our best efforts that include changes in diets, improved genetics, and improvements in poultry house management, odors on poultry farms cannot totally be eliminated. Poultry growers are aware that odors that reach neighboring properties can cause concerns and that is why they work to minimize them. Litter moisture management is a major opportunity for growers to reduce odors. Effective practices include the use of products that reduce or capture ammonia emissions, proper handling of carcasses and manure/litter, proper operation and maintenance of in-house water lines, and vegetative buffers. A grower's first concern is producing poultry that meets animal welfare guidelines and the high expectations of their poultry companies and customers. Dealing with unhappy neighbors due to complaints takes time away from their main mission. Efforts that foster good neighbor relations is time well-spent. Despite the long history and the importance of the poultry industry to Delmarva, many persons are unaware of how our industry operates. Except for driving by or living near poultry farms, most people in our region do not have direct contact with the poultry industry. For this reason, it is important that poultry growers reach out to their neighbors to show them how they grow chickens and why things are done as they are. Practicing good biosecurity, poultry growers should share information about their operation with neighbors. Show them what goes on inside the poultry house. Often, growers plan changes in their operations. Giving neighbors a heads up about proposed changes and seeking their support could prevent problems later. Growers should put themselves in their neighbors' shoes and determine how they would like living next to their own poultry farm. It is important to keep the property attractive. 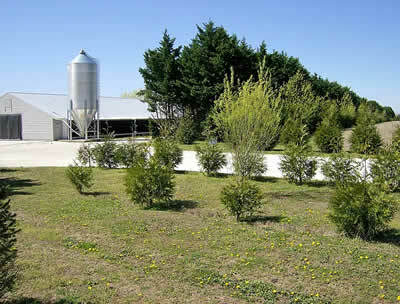 A well maintained farm generally is indicative of a wellrun farm. Properly maintaining grassy areas, keeping weeds under control, and proper trash disposal are small tasks that demonstrate a caring neighbor. Maintaining the roads will help eliminate mud and other debris from public roadways. A well maintained Vegetative Environmental Buffer will help contain dust and feathers from encroaching neighboring properties. A well cared for farm is less likely to generate complaints than one that is poorly maintained. Building good neighbor relations can involve providing an occasional helping hand. Following snow storms, growers should offer to help plow out neighbors. Because poultry growers often have equipment and vehicles that neighbors don't have, growers should generously offer help at other times as well. Few things can create neighbor antagonism quicker than not living up to your commitments. Poultry growers need to do what they say they are going to do. Being a good neighbor is as simple as practicing the Golden Rule.